rc775 is missing the hibernate tab under the power scheme options. We need to figure that out. One thing I found in searching is that the tab disappears if a reboot is required to finish installing some MS updates. When I went into my BIOS settings apon restart I changed my Power settings from API/ACPI to simply ACPI and restarted. I logged in and lo' and behold I had my options back (including the hybernate option on power options console). Edited by 123Runner, 17 April 2011 - 12:45 PM. Click OK (Enter in Vista). 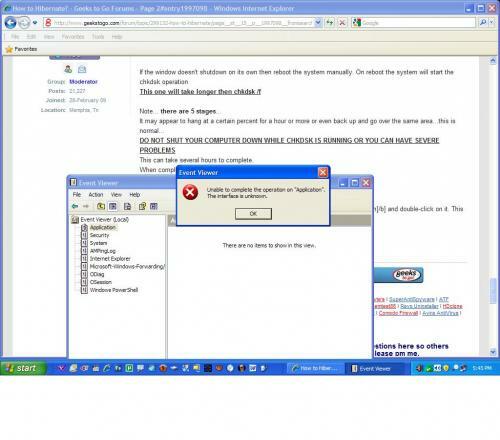 If System File Checker (sfc) finds any errors, it may ask you for the CD/DVD. 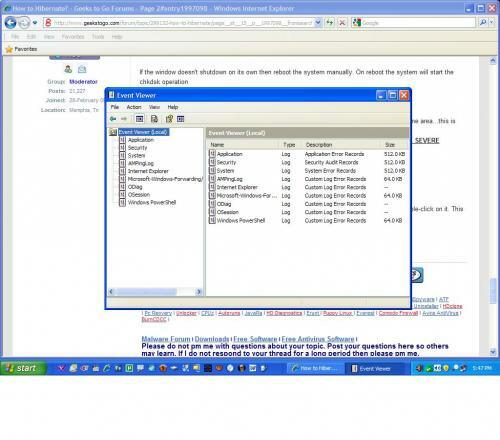 If sfc does not find any errors in Windows XP, it will simply quit, without any message. 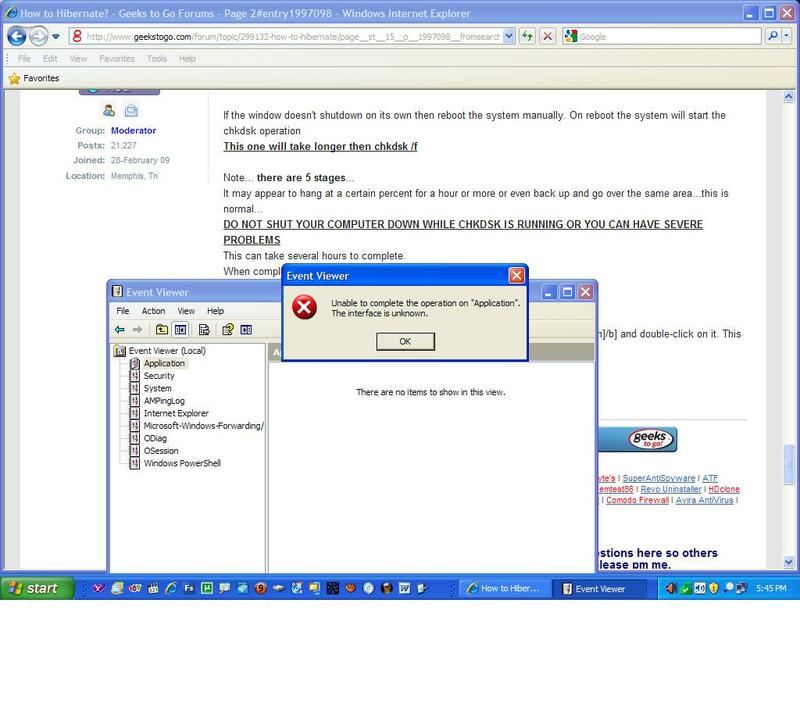 In Vista you will receive the following message: "Windows resource protection did not find any integrity violations". For Vista users ONLY: Navigate to C:\Windows\Logs\CBS folder. You'll see CBS.log file. Usually, it's pretty big file, so upload it to Flyupload, and post download link. This applies mostly to Windows XP, since Vista rarely requires use of its DVD while running "sfc"
Note This method will not necessarily work as well, as when using Windows CD, because not always ALL system files are backed up on your hard drive. Also, backed up files may be corrupted as well. You will see various entries Values on the right hand side. It probably has an entry pointing to your CD-ROM drive, usually D and that is why it is asking for the XP CD. Now, double click the SourcePatch setting and a new box will pop up. Now restart your computer and try sfc /scannow again! Do you have a valid XP CD? retrieves the correct version of the file from %Systemroot%\System32\Dllcache or the Windows installation source files, and then replaces the incorrect file. If you want to see what was replaced, right-click My Computer and click on Manage. In the new window that appears, expand the Event Viewer (by clicking on the + symbol next to it) and then click on System. Have you recently reinstalled the OS? The more I dig in to this the more it keeps turning up a possibility of outdated drivers. From another search I found reference to the chipset drivers not installed. I recently reinstalled Windows XP on my desktop and encountered the same thing. I had hibernation enabled in the power configuration within Windows, and I had APCI set up correctly in the BIOS. When I went to shutdown, the ''standby'' button was greyed out and pressing shift showed that hibernation was also unavailable. Before reinstallation, both Standby and Hibernation were functional. After much looking into, I found that all drivers installed must support this function. The default drivers that come with Windows XP that automatically install your hardware during setup may allow your hardware to work, but they may not allow standby or hibernation. I had to go through each component and download/update to the latest drivers from the manufacturer. Turns out, it was my motherboard chipset driver that after I installed the latest driver, the Standby and Hibernation button during shutdown was no longer greyed out and was functional again. Turns out, it was my motherboard chipset driver that after I installed the latest driver, the Standby and Hibernation button during shutdown was no longer greyed out and was functional again. I think you are on to something here 123Runner. Running Windows File protection, 3/4 done. My Hibernate tab has left the building! This can take several hours to complete. When completed it will boot the system back into windows. We will advise after studying the log. Ok, did this a couple wks ago, usually takes about 45 min. OK something isn't right here. I think we need to go a different way here. What I would suggest you do is to Backup your Data Files. For this I would suggest using a External Hard Drive Enclosure. This will allow you to keep your Important Data safe and Separated from the main system in case of problems. The cost for this kind of Backup System has come down a lot. I would suggest a 500 Gig capacity for your needs. Since you will only be Backing Up Data Files Only this should be sufficient to do that for you. Follow the next two links to see examples of the price you will be looking at. I suggest going to Microsofts Backup Tutorial and follow the steps to do a Backup to a External Drive and also it will guide you on how to do a Scheduled Backup even at night. Another way you can do a Backup is by using DVD’s. This method is just as effective and can be done using the same steps as above. After the above is done then go on to the next step. ·	Insert your Windows XP CD in your CD-ROM and then Restart your computer. ·	Find the Advance Options or Boot Sequence screen. ·	You will need to change the boot sequence so that the CDrom is first and the HD is second. ·	Press F10 to Save and Exit and then press Enter to accept. ·	When the "Press any key to boot from CD" message is displayed on your screen, press a key to start your computer from the Windows XP CD. ·	To setup Windows XP now, press ENTER. ·	At this point an option to press R to enter the Recovery Console is displayed. DO NOT SELECT THIS OPTION. ·	On the Windows XP Licensing Agreement screen, press F8 to agree to the license agreement. 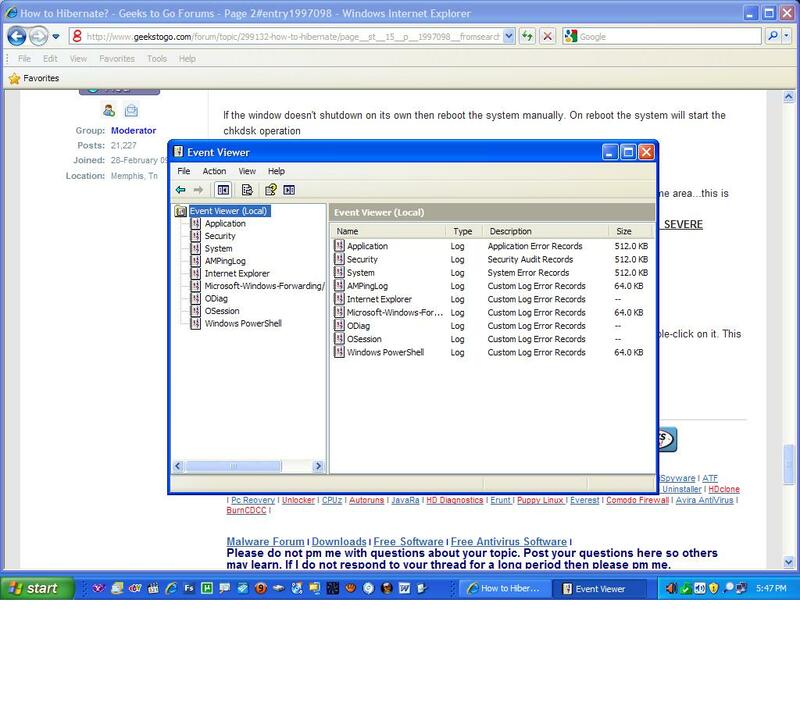 ·	Make sure that your current installation of Windows XP is selected and highlighted in the box, and then press the R key to repair Windows XP. ·	Follow the instructions on the screen to complete Setup. to read a step by step tutorial with screenshots. OK, I have a couple more HD's I can use and a couple more computers for back up. Not sure how to keep all the microsoft updates, etc. from having to go that long process over again. You will have to do all the updates again. No way around that when you do a repair installation. That is interesting. Never seen that before in event viewer and then the error.